Ray Ray is still *that* guy. How many years has he been in the game and he still manages to keep it fresh! This track follows Radio and Good Man as the third single off his '60s-infused album, Stone Rollin’ which was released earlier this year. 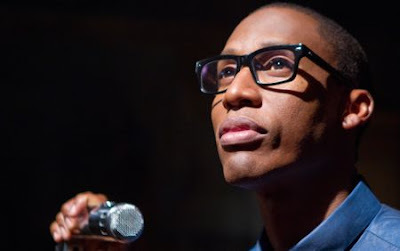 For the latest single "Movin' Down the Line," Mr. Saadiq leaves his retro mode at home and offers up some on tour footage as well as some private impressions from the crooner. "Movin' Down the Line", an ode to a love unrequited, features mellow horns, jangling guitar, heavy bass lines, and a swelling string and piano conclusion. Music writer Lloyd Bradley writes that the song exemplifies the album's combination of traditional style and contemporary detail, stating "It has every bit of digital snap needed to succeed among today’s sounds; but Saadiq’s masterful use of a big brass section lurking w-a-a-ay into the background picks the tune up and puts it down in a completely different era. The song turns out both laidback and urgent at the same time, and is utterly irrepressible for it". "Moving Down the Line" is definitely my favorite track on the record. The arrangement put me in the mind of lush, floor walking Marvin Gaye song. The visuals are nicely cut together are compliment the song very well indeed.